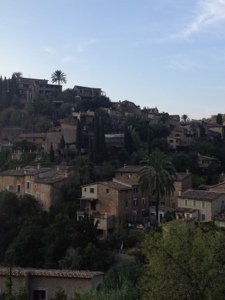 Spent a very lazy Saturday exploring the main town of Soller and the hilltop resort of Deià. 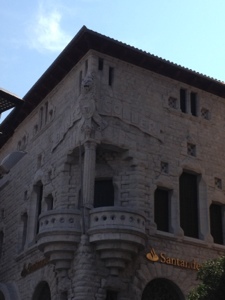 We were anchored in the harbour of Soller but the main town is two miles inland. There is a sweet wooden tram that takes you there and Saturday was market day so it was very busy and bustley. It gained its wealth from oranges and there is evidence of olive, lemon and orange groves as you come into town. After shopping at the market, we went back to the boat for lunch and then looked for a taxi to take us to Deià, the resort town set in the hillside above the bay we tried to get into the night before. After a phonecall and 30 mins of waiting there was still no sign of a taxi unless you wanted to go to Palma. I suspect it had something to do with a cruise ship tour that needed to get back to their ship! So we decided to sail round and see if there was space and luckily we were the only ones. Shortly after we arrived, a British boat came haring into the anchorage, did a handbrake turn, dropped the anchor in the swimming area nearly t-boning a small yacht in the process. And we wonder why the UK has a reputation for arrogance. Having safely anchored amongst the rock and sand, we went ashore to walk up the ravine to the resort itself. 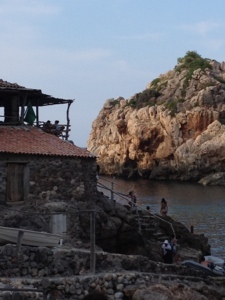 Deià was stunning with a real Tuscan feel to it. Stone houses with red tiled roofs set into the hillside. It became famous when Robert Graves, author of I, Claudius set up home there. His house is now a museum but it was shut by the time we got there. The town itself is full of interesting shops, bars and award winning restaurants. If we hadn’t had to walk back down unlit paths and roads we would have eaten there for sure. Instead, we ambled back just before dusk to have a lovely meal on board courtesy of Mags and Sam but I think we will all be going back there at some point in the future! 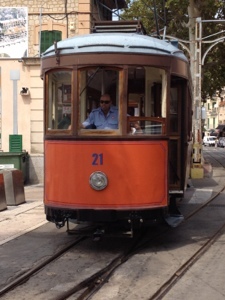 Pictures below of the tram to Soller and of the town, the cala at Deià and Deià itself. Fantastic, this is the cove and town that I was trying to describe to you! Beautiful. There’s a great tapas restaurant if you ever go back.